There is a ton of stress involved with the passing of a loved. The grief, the arrangements, the services—all of those things alone are enough to deal with it, but then there’s the estate to worry about as well. You don’t necessarily need to hire a lawyer or expect for a messy court case regarding the property of a deceased loved one, but you should certainly schedule a consultation. This will ensure that you are aware of your rights and what steps to take regarding any property belonging to the departed loved one. A little empathy can go a very long way when dealing with grief. This is something we make our personal mission when we find out a customer is grieving. Our staff does everything we can to help customers through a difficult time—whether it’s by expediting an order for a memorial or sending a personal note with our condolences. When you’re struggling with grief, the last thing you want is to be treated like just another number so make sure any vendor you work with—from the florist to your lawyer—treats you with empathy and care. The Silent Generation and Baby Boomers had a tendency to hide valuables in seemingly random everyday items. As you’re going through a loved one’s belongings, open tin cans in the cupboards, check pockets of old jackets and check under—and even inside—mattresses. You never know what you might find. In fact, one ScanMyPhotos customer found a letter from her departed mother that was buried inside a box of old print photos. She would have missed it if she didn’t need to go through and re-organize the pictures. So, make sure you sort through estate items with the utmost care. 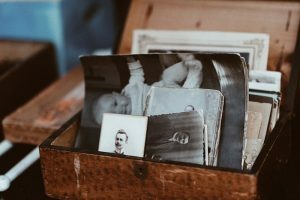 As you’re sorting through the estate items, odds are you’ll run into personal memorabilia or vintage print photos. These items are invaluable in terms of both sentimentality and historical significance. Our advice is to collect all the letters, notes, cards, loose print photos, and photo albums. You should dedicate a space to these items and sort through them carefully (if you need advice organizing, check out the interview we had with professional organizer Andrew Mellen). Once you have all these memories sorted, you’ll want to take steps to move these items from analog to digital. While we can’t help digitize the documents, we can help with the print photos. Send your loved one’s print pictures to us so we can scan and digitize them. You can then distribute the digital copies to anyone who your loved one’s life touched. This entry was posted in Uncategorized and tagged estate, estate management, family history, genealogy, managing memories, old photos, photo by Monika Jansen. Bookmark the permalink.